The Quandrantids Meteor Shower peaked this week on Jan. 4th. I wasn't able to go out of the city so I set up in my backyard, which happily has one of its best night sky views pointed right at the meteor shower radiant. Thanks to the strong light pollution of the city I only saw three bright ones and a few dim ones, though I did see one brilliant green meteor. So, where are all the meteors in this image? There actually is one very dim green one that I'm going to guess is the brilliant one but it barely registered above the city light pollution (good luck finding it, it's near the branches on the left side of the center tree. Not quite exactly what I was hoping for, but at least I now have a cool night sky image from our backyard! Image Notes: This is a stack of 269 25 second exposures at 17mm, f/3.2, ISO 1250. I altered WB to 3450 K to limit the effects of light pollution and did further color correction in post. The foreground came from shots exclusively shot for such and was blended to the frame after the star trails image was stacked. 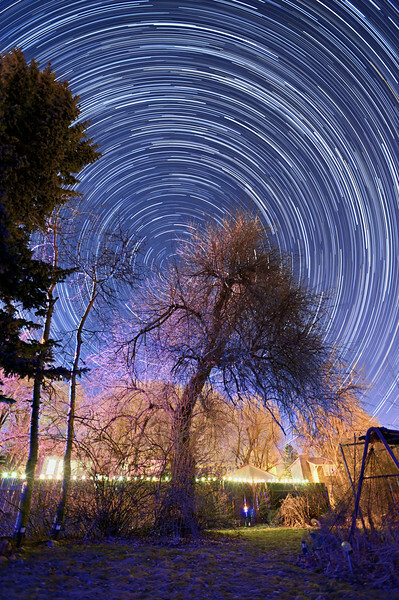 Finally for stacked star trail smoothing I tried out Star Tracer for my first time. It's still a bit of heavy lifting to mask out the foreground and set all the star points, but it really does work a treat on smoothing out the Morse Code that can come from stacking at times. Check out a trial of the program here ( http://www.tawbaware.com/startracer.htm ) .